What I like about Jack’s Gourmet sausages most, specifically and because of their superb taste, is the many dishes they can be used in. This past Tuesday I made a Sausage Pizza using both their Sweet Italian and the Hot Italian sausages and I used SYR‘s simple recipe. Put crust in oven for 7 minutes to make it crisp. Take out crust and pour in pizza sauce, thin and evenly. Suatee the chopped mushrooms, onions, and garlic, lay them out on the sauce. Sautee the spinach and the basil, add on the sauce. 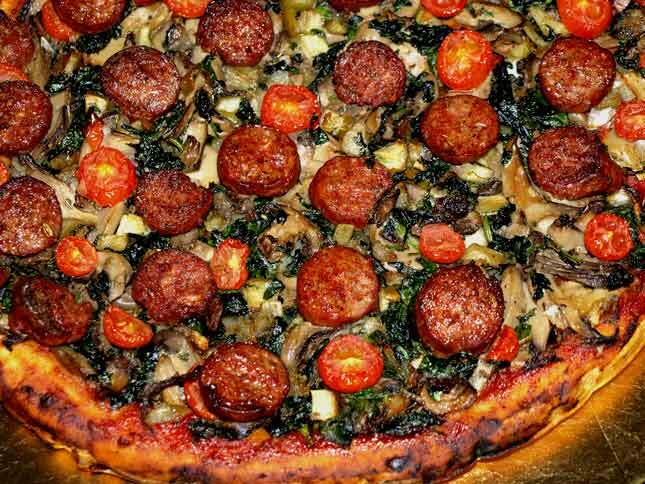 Add the sausage slices, alternating each time between the Sweet Italian and the Hot Italian. Sprinkle the whole with the oregano. salt and pepper. Put in oven for 15-20 minutes or until sausage slices look slightly brown. I washed it down with a glass of well chilled Bartenura Asti Spumante. Scrumptious and delightful pairing I would have enjoyed it tremendously even if I had ordered it in a restaurant! Prepare an ice water bath by filling a bowl halfway with ice and water; set aside. Bring a small saucepan of well-salted water to a boil over high heat. Add shallots and blanch until tender, about 30 seconds. Drain shallots and place in the ice water bath until cool. Drain and set aside. Combine vinegar, NatraZyle, and 1 teaspoon of the salt in a small saucepan and bring to a boil over medium heat, stirring until the Xylitol, or sugar, has dissolved. Pour the boiling liquid over the reserved shallots and pickle until the shallots are slightly wilted and have lost any sharp taste, about 5 minutes. Drain the shallots into a strainer set over a large, heatproof salad bowl, collecting any pickling liquid in the bowl; set the shallots aside. Whisk the mango juice, mustard, remaining 1/2 teaspoon salt, and pepper into the pickling liquid. Slowly drizzle in the olive oil while whisking until the vinaigrette is emulsified. Taste and adjust the seasoning as needed. Heat the sausages in a sautee pan with a small amount of oil until golden brown on all sides, approximately 4-6 minutes. Add the sausage slices to the salad. Add the radicchio, curly endives and mango slices and toss well to combine. Top with pomegranate seeds, pickled shallots and serve. The contrast between the mild Boereworks and hot Mexican Style Chorizo combined with the rest of the salad should be very interesting. I can’t wait! I made your salad last night, but instead of Boereworks and Chorizo I used only Bratwurst sausages. It was a smash hit! THAAANK YOU!!! On Motzey Shabbat, be-ezras Hashem, I’ll make SYR’s pizza recipe. Will let you know how that works out. That salad recipe IS very good, I made it last night and it was one of the best (if not THE best) salads I ever made! I will add the colorful photo soon. Last night I made SYR’s Sausage Pizza recipe, woooow!!! I hope you and SYR continue providing us with such superb, easy to make recipes.